MicroSerum Review 2019: Is MicroSerum a Good Hosting? MicroSerum specializes in offering web hosting, VPS hosting, and custom dedicated infrastructure to its customers. The company has its own data center in Montreal (Canada), and it rents equipment from multiple sources for its European hosting. MicroSerum partners with leading industry players and uses the latest technologies to offer unique and flexible hosting products. Its key offerings are shared web hosting, VPS hosting (including game VPS), and custom dedicated servers. In addition, it offers colocation, I.T. consultancy, and managed I.T. services. It’s hard to say when MicroSerum started offering hosting services, but to date, the company has served 1300+ customers and has deployed 2000+ VPS. It boasts four points-of-presence, and it provides 11 Gbps global connectivity. MicroSerum’s website supports French and English. You get a simple interface that comes with web FTP, DNS zone editor, webmail, and much more to help you manage your website easily. MicroSerum’s flexible services can be customized to suit particular customer needs, and you can easily upgrade the scalable plans when you need to. You can also choose from various Linux and Windows operating systems. MicroSerum also offers two custom dedicated server plans (for its Montreal servers) and 19 VPS plans (LXC and KVM as well as game VPS). You can get a free dedicated IPv4 with the VPS plans, plus additional IPs (IPv4 and IPv6) at affordable prices. The company also offers hardware RAID and software RAID along with host bus adapters. 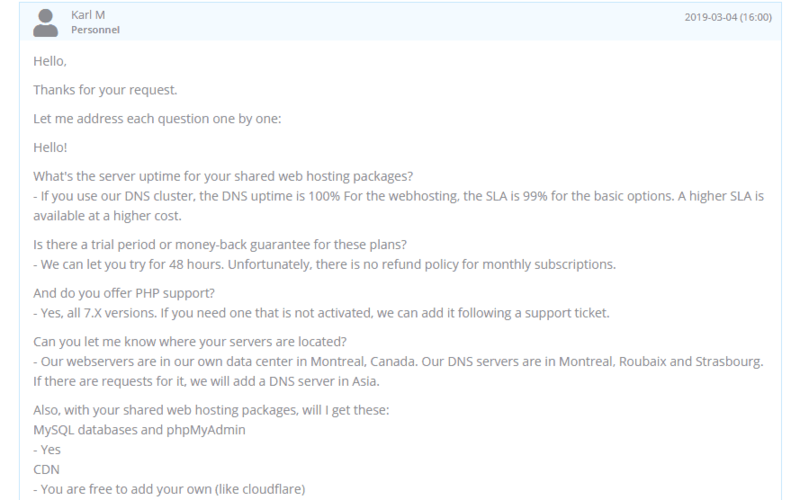 Basic web hosting plans come with an SLA-backed 99% uptime, whereas DNS cluster users can enjoy 100% uptime. MicroSerum’s shared hosting plans are expensive; its entry-level plan is almost twice the industry average. The plans are payable in Canadian dollars or euros on monthly, quarterly, semi-annual and annual billing cycles. While there is no money-back guarantee, the company told me that it could offer a 48-hour trial period. While basic support is included for free, you can also purchase priority support. If you prefer to support yourself, MicroSerum’s knowledge base (in the client area) and blog would be the best starting points, but the knowledge base contains only 31 articles. For reliable but pricey hosting, you can join MicroSerum’s 1300 mostly happy customers. Check outMicroSerum’s high-priced but reliable hosting plans. Wondering how MicroSerum stacks up against other Web Hosting companies? Enter any other Web Hosting company and we will give you a side-by-side comparison.